StageLight supports VST instrument and FX plugins. 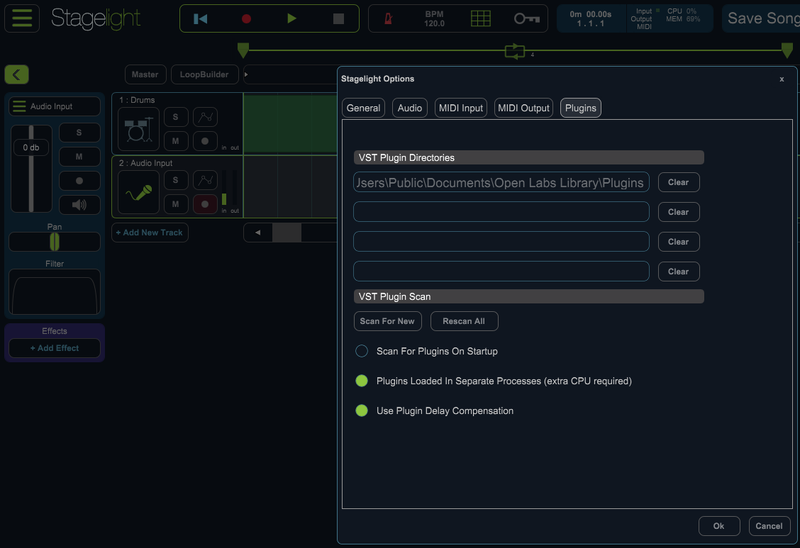 To use VST plugins in StageLight you will need to go to Menu > Options > Plugins and set your plugin directories by clicking in one of the four blank slots. The most common plugin paths are C:/Program Files/VstPlugins and C:/Program Files/Steinberg/Vstplugins. Check these locations outside of StageLight before you set your plugin directories to be sure that you setting the correct path. After you have set your VST plug in paths, press the Rescan All button. It may take a few minutes to scan all of your VST plugins.